In 1958, Leonard Bernstein, recently appointed music director of the New York Philharmonic, hired as his assistant Jack Gottlieb, a composer with a Ph.D dissertation on Bernstein’s music. Gottlieb’s job description seemed indeterminate: from vetter of compositions sent to Bernstein for potential performance to general “gopher.” In this latter capacity, Gottlieb traveled the globe with the peripatetic maestro, seeing to Bernstein’s toiletries, packing his bags, managing transportation, and otherwise working hard but, in Bernstein’s company, having a thoroughly good time. Apparently Gottlieb performed splendidly, and, save for four years when he took a position teaching composition, he remained at Bernstein’s side until Bernstein’s death in 1990. No doubt, the friendship that ensued was cemented by shared Jewish faith and Gottlieb’s extraordinary competence in understanding Bernstein’s music. Indeed, Bernstein would come to entrust Gottlieb with writing the program notes and commentaries to accompany the published scores, recordings and performances of Bernstein’s own music. Now Gottlieb, some twenty years after Bernstein’s death, has written this work, Part I of which is a memoir of his experiences with Bernstein, and Part II of which contains his collected program notes and commentaries. Readers will learn, in Gottlieb’s Introduction, of Bernstein’s Jewish liberal humanism and of the social issues that motivated the greater part of Bernstein’s compositions. In Part I, Gottlieb discusses working with Bernstein, the maestro’s work habits and the division of labor between domestic and business staffs. Much more follows, including many colorful anecdotes. Inevitably, hanging around with Bernstein had its great rewards, such as one Gottlieb gleefully relates, having to do with the Kennedy inaugural in which seven people, including Bernstein, were scrunched in a car with Gottlieb winding up with the actress Bette Davis sitting on his lap. Gottlieb chronicles Bernstein’s and the NY Philharmonic’s tours in the Soviet Union, Western Europe, Israel, and Japan, always with up-close glimpses of Bernstein associating with heads of state, such as Golda Meier, Queen Beatrix of the Netherlands (as she and Bernstein grab an otherwise forbidden smoke) and other luminaries. There are reminiscences of Bernstein with Jack and Jacqueline Kennedy. Stravinsky appears on the scene, as does Bernstein’s good friend, the soprano Jenny Tourel. Gottlieb depicts Bernstein at work during rehearsals, but also Bernstein’s madcap auto driving habits. We also are treated to a sensitive discussion of Bernstein’s homosexuality, and his work in the struggles for AIDS research funding. 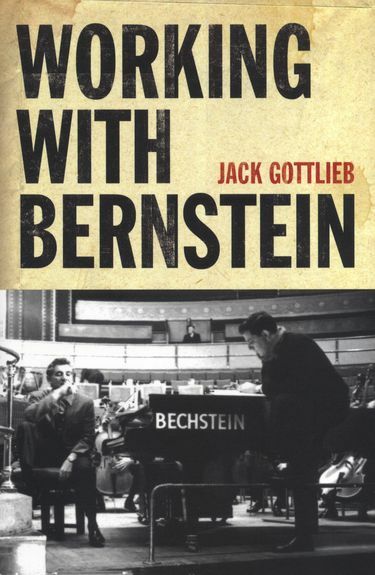 In fact, Gottlieb guides us around the extraordinary panoply of Bernstein’s activities, for example, offering a fascinating discussion of “shooting the orchestra”—the techniques and technology of filming/televising an orchestral performance—including how the cameras are positioned, and how the director becomes a virtual conductor as he or she shadows the performance, reading cues from within the orchestral score. An added treat: collectors of Bernstein’s recorded performances, both of his own music and other composers, will no doubt find interest in Gottlieb’s own list of best recorded performances. Part II is a goldmine of its own. Although almost all of these program notes and commentaries have been published previously as liner and CD notes, or for concerts, their concentration in one place serves as a wonderful guide to the Bernstein oeuvre—symphonies, songs, choral works, works for dance and theater. I shall concentrate on Bernstein’s Jewish music as understood by Gottlieb, with a brief word on methodology. In an excellent essay of 1971 reproduced whole in the book, ”Jewish Mass or a Catholic Mitzvah?” (an essay included in Part I that is worth the price of book itself), Gottlieb writes that Bernstein “imposed upon” the Catholic Mass “a decidedly Jewish weltanschauung” (134), an intrusion of Jewish irony. As Gottlieb writes, “a distinctive Jewishness pervades this Catholic work” (133). Now it must be understood that Gottlieb tends to assume the role of music theorist in his writings. His concerns with Bernstein’s compositions are not sociological or cultural-critical but rather formal and structural. For example, back in 1965 when he wrote commentary to Bernstein’s Kaddish (as reproduced in Part II of his book) he noted that Bernstein’s detractors may have been motivated by anger at the composer’s “extra-compositional activities” and/or at his depicting God as a “Tin God.” That Gottlieb did not discuss those activities is one thing; more importantly, he did not explain why Bernstein wrote of God as made of tin, surprising inasmuch as Bernstein’s text to Kaddish was outspoken in its upset with a God who did nothing while horrific bomb and shell bursts had been killing millions. Rather than discuss this extra-musical material, Gottlieb instead discussed Kaddish as a theatrical piece, and went on to formal analysis of the music. Such formal analysis then, is Gottlieb’s forte, and his resulting essays are models of concision and clarity of expression. A few of Gottlieb’s essays, including one on Bernstein’s use of a 1-3-2 motive in Mass, may prove daunting to the non-specialist. Another example would be his commentary on how Bernstein worked the Tetragrammaton—the four Hebrew letters of God’s name—into the “Masque” sequence in his Symphony No. 2, Age of Anxiety. Fortunately, however, most of Gottlieb’s program notes are very accessible to the non-specialist, who will gain immensely from reading through even the more analytic essays. Indeed, all readers will find illuminating Gottlieb’s discussion of how Bernstein incorporated gematria—the methods of mathematical manipulation developed in part by specialists in the Kabbalah—into compositions such as Jubilee Games and Dybbuk. Readers will also be interested to learn how Bernstein employed tonal ambiguities if not atonality at the end of each of the two Dybbuk suites in order to express qualities of the ineffable and the mysterious. Gottlieb most provocatively suggests that the Dybbuk Suites will prove to be Bernstein’s greatest masterpiece. Listeners who do not share Gottlieb’s observant-Jewish sensibilities may disagree, joining those who argue that the suite to West Side Story is the greater work. But Gottlieb may very well be right. The issue will probably remain unresolved, but meanwhile, we have his delightful and informative book to place prominently in the Leonard Bernstein section of our library.